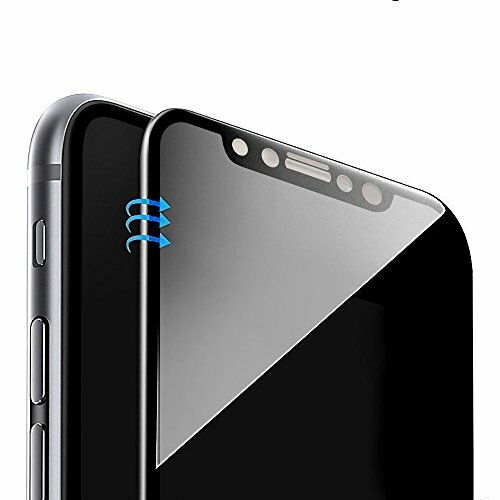 Made for iPhone X, full cover privacy screen protecter, full protection, touch-sensitive, 100% 3D touch compatible. 1. Visible Area of 90 degree, protect your privacy. Privacy protective screen protector can protect your private information safe. High quality privacy film in portrait or landscape viewing modes. Screen is Only visible to persons directly in front of screen. Keeps unwanted wondering eyes from seeing what you are doing. 2. 0.33mm thick and 9H hardness. Easy installation and no residue when removed. 100% Compatible with 3D Touch functionality. [0.3mm] Hydrophobic and Oleophobic screen coating protects against sweat and oil & water residue from fingerprints. Real touch sensitivity for a natural feel that provides flawless touch screen accuracy, comfortable touch. Ant10-Shatter feature: If broken, the protector breaks into small pieces that are not sharp, making it safer than other glass products. Made for iPhone X, full coverage, full protection, touch-sensitive, 100% 3D touch compatible. Screen is only visible to persons directly in front of screen. Easily Install & Warranty: Easy to install and remove (Bubble-Free / No Residue). We provide 12-month warranty and friendly customer service, please contact us if there is any problem.